Fungus gnats and fruit flies in the kitchen are a common problem for homeowners. From the indoor plants in your home to the overripe fruit on your counters, your home is the perfect breeding grounds for these tiny flying insects. Your kitchen is full of moisture and decaying organic material that is the main food source for fungus gnats, fruit flies, and drain flies. 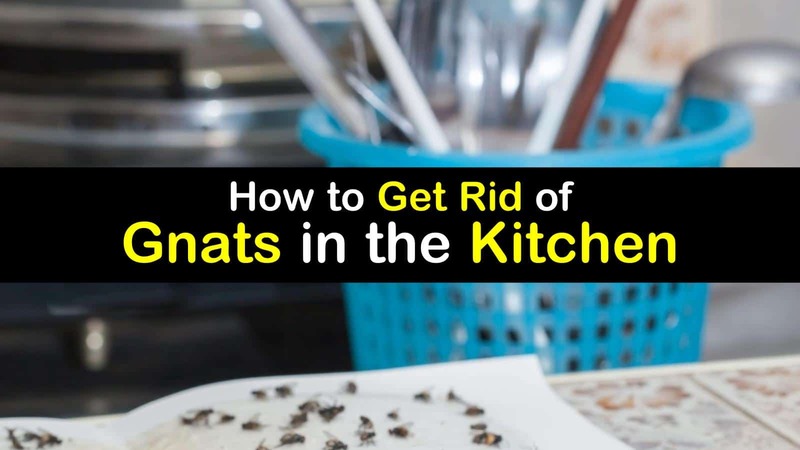 If you are dealing with a gnat infestation in your kitchen, you’ll want to learn how to get rid of gnats in a kitchen with solutions that are non-toxic. How Can I Get Rid of Gnats in My Kitchen? Can I Kill Gnats with a Vinegar Trap? How Can I Kill Gnats in My Kitchen Sink? What Essential Oils will Repel Gnats? The damp areas throughout your kitchen are rich in fungus, which is what draws fungus gnats inside. Homes provide the fungal growth that gnats need to survive and are also the perfect place for them to develop and reproduce. If you find these small flies in the kitchen, it could be because of your trash cans, potted plants, dirty dishes in the sink, overripe fruit, and dirty garbage disposal. It is important to get rid of kitchen bugs quickly before there is a real problem. The first step to effectively get rid of gnats is to remove the sources that attract the gnats in the first place. If you have a gnat problem, start by removing overripe fruit, running the garbage disposal regularly, emptying trash cans, and letting the soil of your potted plants dry out before watering again. If you find gnats in the fridge, make sure to clean out any overripe or rotten fruit. You can also check your window screens, window frames, and doors and repair any holes or cracks that may be letting gnats into your home. An effective home remedy for dealing with a fly problem is to create fly traps using apple cider vinegar and dish soap. If you don’t have any cider vinegar on hand, you can substitute it for red wine. Place the apple cider vinegar and dish soap in the container. Cover the opening with plastic wrap. Pierce a few small holes with a toothpick, in the plastic wrap. The gnats will enter into the bowl through the small holes but will be unable to get back out of the gnat trap. Their long legs and wings will get covered with dish soap, rendering them unable to fly out of the liquid, resulting in drowning. If you have black flies coming out of the drain in your kitchen sink, you’ll want to know how to get rid of gnats in the kitchen sink. The best method for getting rid of these nasty little flies is to pour bleach down your sink to kill any eggs and gnat larvae that may be in the drain. Follow this with boiling water to flush out the organic material that gnats thrive on. Essential oils have long been used for pest control. You can use many essential oils for flies in house including, lavender, peppermint, eucalyptus, tea tree, rosemary, cedarwood, and others. Just add several drops of your favorite essential oil to your diffuser and make your entire home smell beautiful while repelling gnats. You can also dilute the essential oils with water and add the mixture to a spray bottle, and spray any gnats that fly near you. Having a gnat infestation in your kitchen can leave you feeling a bit dirty. Use these common home remedies to deal with your gnat problem effectively. These solutions take care of the problem without having to resort to harsh chemicals. 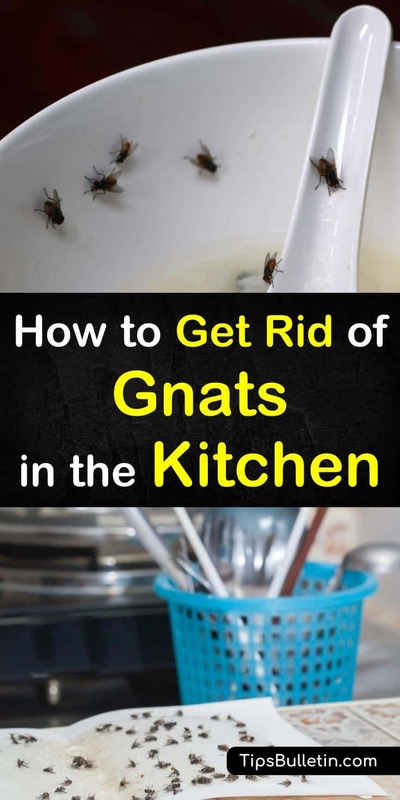 We hope you enjoyed these tips on getting rid of gnats in the kitchen. If you found this information useful, please share it with your family and friends.